This Modern infill is stunning with superior natural light flow, clean lines & crisp white walls meshed with warm wood tones. No carpet here, only wide plank oak hardwood floors throughout all levels! The main level features a high gloss European kitchen with 36" gas range & over-sized island & feature wine display. The living room seamlessly opens up onto the West back deck for summer entertaining & offers a cozy gas FP for the colder months. Spacious dining area, mud room and powder room also on main. The back-lit floating staircase is a work of art. Upstairs includes 2 kids bedrooms & bath, laundry & a fabulous Master Suite with HUGE walk-in closet & 5-pc spa-inspired Ensuite that boasts 10mm glass shower, heated flr, floating vanity & luxury soaker tub. The bsmt is complete with slab heat, hwd flr, bed, bath, storage and a Rec Room with bar. Tons of upgrades & finished to a exceptionally high standard. Finished dble garage & landscaped yard. 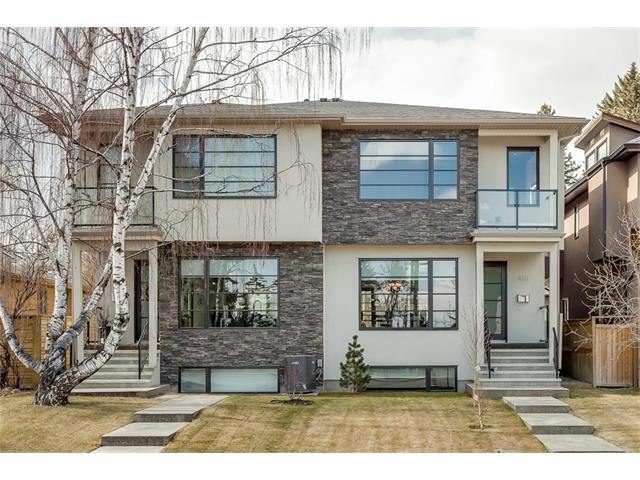 Walk to schools, River Park & Marda Loop! 5 min DT.